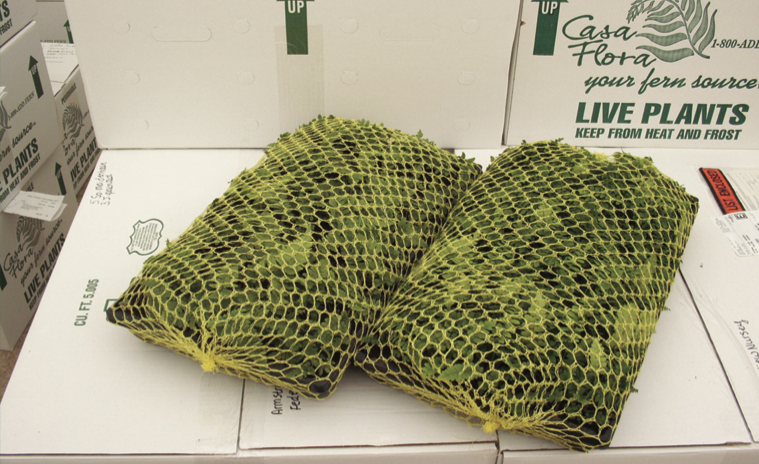 Casa Flora has developed cutting-edge shipping methods for our fern plug trays. Using global best practices, your plants are packed so that they are assured to arrive in good shape. After passing vigorous quality control standards, each plug tray is prepared for shipment. From the last quality control checkpoint, the plug trays travel through a netting chute. A woven net of plastic is stretched around the entire tray and the ends are banded. The now-netted tray is trussed up in preparation to be placed in its own individual divider separator and then boxed. From the boxing station, the boxes move to the last inspection and closing location. Random quality control checks are made at this station and the boxes are closed, labeled and a packing list is affixed. Inside each packing list envelope is placed a mini-cutter with instructions for cutting the netting. There are also handling instructions including a freight and damage claim and a bill of lading showing the shipper and consignee. Completed boxes are assembled by order and placed on pallets. Pallets are then moved to the freight pick up area. We then check to confirm that the shipping documents correspond to the contents and the shipping label. 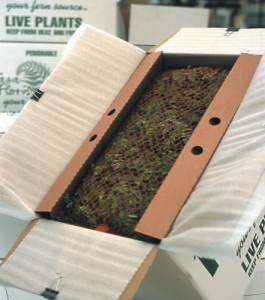 Our system thus ensures that the plants you ordered are what are shipped to you, and that they will arrive in excellent, healthy condition.